I’m not a journalist, I’m not an expert on the Middle East, and I’m certainly not an academic in the field of political science. However, I am someone who has followed the case of the three Al Jazeera English journalists – Peter Greste, Mohamed Fahmy and Baher Mohamed – charged and locked-up in Egypt for doing their jobs. I’ve watched the reports, court hearings, protests and press conferences on TV and online since late-December 2013. Back then, the top news in Australia was the Aussies’ Ashes win (remember those days?) but a story about an Australian Al Jazeera journalist being locked-up in Egypt was starting to be mentioned on Twitter. I’d been a regular watcher of Al Jazeera English but only knew of one Australian journalist with them – a guy called Peter Greste who’d I’d followed on Twitter a few months earlier. It was him. In the 610 days since (at 30 August 2015), I’ve noted some things about the case. Things that are puzzling or outrageous or pure comedy; or just worth a closer look and question. Whatever the level of anger or laughter these things have prompted, they are things I’ve found interesting. And you might find them interesting too. 29 December 2013: Peter Greste and Mohamed Fahmy arrested at the Marriott Hotel* in the evening. Baher, a local, was at home, and arrested later. 21 January 2014: The first of many Greste Family press conferences takes place. 18 June 2014: Egyptian Al Jazeera journalist Abdullah Elshamy is released from detention due to poor health, after five months on a hunger strike. 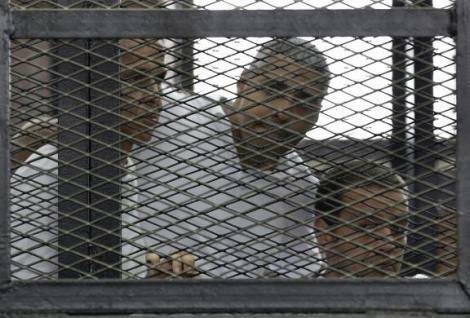 23 June 2014: Greste, Fahmy and Baher Mohamed are found guilty, and sentenced to prison. 1 January 2015: Egypt’s highest court of law, Court of Cassation, reviews the Al Jazeera case. A retrial is announced. 1 February 2015: Greste is released from prison by order the president; arrives in Australia on 5 February 2015. 12 February 2015: Fahmy and Baher Mohamed are released on bail. 23 February 2015: Retrial starts. 29 August 2015: Courts finds the three guilty and gives them reduced sentences (three years each; with Baher Mohamed receiving six extra months). ABC Australia has produced a detailed timeline if you are interested in more, or if you prefer a video timeline, Al Jazeera produced this one-minute summary. *The reason some Egyptians call the case of the three ‘the Marriott Cell’; and what Fahmy is calling the book he is writing about the ordeal. Peter Greste: A Peabody-award-winning Australian-Latvian journalist who has worked for BBC (Kabul), Reuters, and GMV6 (in Shepparton, Australia!). He has been based in Kenya since 2009. It has been said he is well respected by many at the UN for his work reporting throughout the African continent. Greste went to work in Cairo in December 2013 to help cover some Christmas leave of Al Jazeera colleagues; he had never been to the city before (You can watch the last report Greste did, before arrest, online). While in prison, to help with mental health and pass the time, he began a Griffith University masters degree in international relations. Mohamed Fahmy: A Peabody-award-winning Egyptian-born Canadian journalist, author and producer who has worked for the New York Times, CNN; and Al Jazeera since September 2013. He had an arm injury that went untreated while in prison, creating lasting disability, and, against everything in his heart, he dropped his Egyptian citizenship in an effort to help his case. Fahmy had trouble sorting out ID papers/passports while on bail, which he needed to marry his fiancé Marwa, but they are now married. Since arrest, he has been very critical of Al Jazeera management and has chosen to have different legal representation. Baher Mohammed: Award-winning journalist with a career that includes Japan’s Asahi Shimbun newspaper, and working freelance for CNN and Iran’s (English) Press TV. He has worked for Al Jazeera since May 2013. Baher Mohamed is the born-and-bred Egyptian with three children; one born while he was locked-up. When the police came to Baher Mohamed’s home to arrest him, they reportedly wouldn’t allow his wife time cover herself (with hijab; as police were ‘other men’ in the house), stole $2000, and shot his dog. All three work for Al Jazeera English and not for Al Jazeera Arabic. Peter Greste, Mohamed Fahmy and Baher Mohamed (‘the three’) are accused of supporting the overthrown Muslim Brotherhood party (designated a terrorist organisation by the current Egyptian government). All are charged with joining a terrorist group, aiding a terrorist group, and endangering national security. Baher Mohamed has an extra ammunition charge of possessing a bullet casing, which he claimed he had taken as a souvenir from a Cairo protest. The three, and the Al Jazeera network, maintain they were simply doing their job, and any contact they had with the Muslim Brotherhood was to uphold a core journalism principle of getting both sides of the story. The court tried a total of 20 people in the case – 11 in their absence; ‘in absentia’. Those on trial included other Al Jazeera staff and a group of Egyptian students. Of the 11 charged in absentia, they included six other Al Jazeera staff. Egyptian prosecutors allege the 20 journalists set up a media centre for the Muslim Brotherhood in two suites in the Marriott Hotel. It has been said that as many as 20 other journalists are currently locked up in Egypt, separate to the FreeAJStaff case. I mention the 20 because a) they hardly get any attention, and b) it ‘might’ show that the crack down on the press is not limited to Al Jazeera journalists. 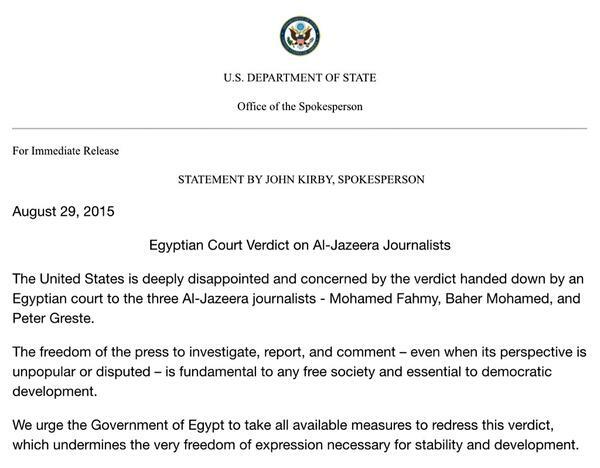 While the reported ‘difficult’ Egypt and Qatar relationship ‘might’ be a part of the FreeAJStaff case (i.e. because Al Jazeera is state-funded by Qatar, the three might be caught in a bigger political argument), it doesn’t explain, for example, Shawkan Zeid, a photojournalist who has been locked up without charge for more than two years. You can read more about journalists locked up in Egypt on the Committee to Protect Journalists website. There is not much to say about the evidence in the trial other than that it varies from non-existent to laughable. It included videos of Gotye’s worldwide hit and photos of Greste family holidays in Europe. When Egypt’s highest court of law, Court of Cassation, reviewed the Al Jazeera case in January 2015, it agreed some of the evidence was… dodgy. Al Jazeera arranged legal representation for the case*. In May 2014, the lawyer representing the three quit, reportedly due to a dispute with Al Jazeera. He is said to have disagreed with the network’s move to sue Egypt for $150 million for the mistreatment of the journalists/jamming satellites/closing the Cairo bureau, while the trial was in progress. Since then, Greste and Baher Mohamed have used the same Egyptian lawyer for hearings (Peter has added legal support in Australia), but Fahmy has arranged his own representation, appointing human rights lawyer Amal Clooney for further support. *At a press conference on 29 August 2015, the network’s management said it has paid legal, medical, bail and salary costs for the journalists. Greste’s family has done independent fundraising to help pay for travel so a family member was always near Peter, and Fahmy is self-funding his independent representation. The first time round, when found guilty, the three each received seven years in prison, with Baher Mohamed receiving an extra three years because he was found with ammunition. The journalists in absentia each received 10 year prison sentences. The second time round, the three received three years each, with Baher getting an extra six months for the ammunition. In delivering the re-trial verdict on 29 August 2015, the judge said one of the issues was that Al Jazeera was not a member of the Egyptian journalist syndicate. This point was not raised at any time before the re-trial verdict. What is especially strange about this point is that the Egyptian journalist syndicate is for press in Egypt – and as a Qatari broadcast organisation, Al Jazeera English is neither. 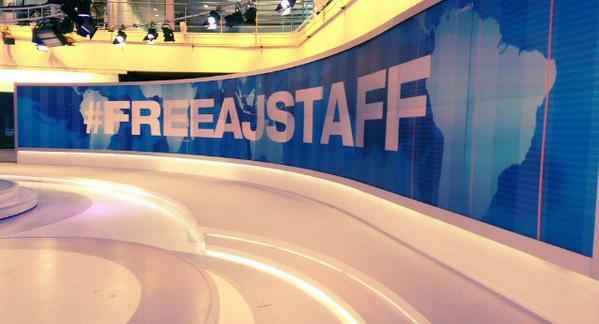 Started by Greste’s colleagues in Kenya, picked up by concerned citizens globally, and turboboosted by news organisations everywhere, the #FreeAJStaff hashtag has been a constant source of updates and reminders about the case, and helped to keep attention on the case. Media and human rights professionals and supporters around the world have tweeted, posted, graffitied, drawn, fundraised, letter-written, postered, rallied and shouted both the need to free the journalists and the importance of a free press. Anyone who watches the Al Jazeera English news in recent times will know that it opens with #FreeAJStaff appearing on the ‘super wall’, as a reminder to audiences everywhere that the network’s journalists are still not free. You can read more about the campaign on the Al Jazeera English website. Media outlets of all types have seen the case as an attack on press freedom everywhere, undermining the important role the media plays reporting the facts; and helping hold governments to account. BBC staged protests outside its London HQ, and the U.K.’s Channel 4 ‘silenced’ its webpage, to name just two of the very many media organisations that made its protest clear. Familiar faces have been involved in Al Jazeera’s FreeAJStaff campaign videos too. Although it was banned from reporting in Egypt, Al Jazeera still needed to get the trial covered. In possibly an unprecedented arrangement, CNN International journalists Sara Sidney and Ian Lee did live crosses from Cairo to Al Jazeera’s Doha studios so Al Jazeera could cover the story at the court. After the Egypt revolution in 2011 that removed Hosni Mubarak (who had ruled since 1981), Mohamed Morsi founded the Muslim Brotherhood. In 2012, Mohamed Morsi became Egypt’s first democratically elected head of state. Morsi’s army chief was General Abdel Fattah el-Sisi (see photo below). 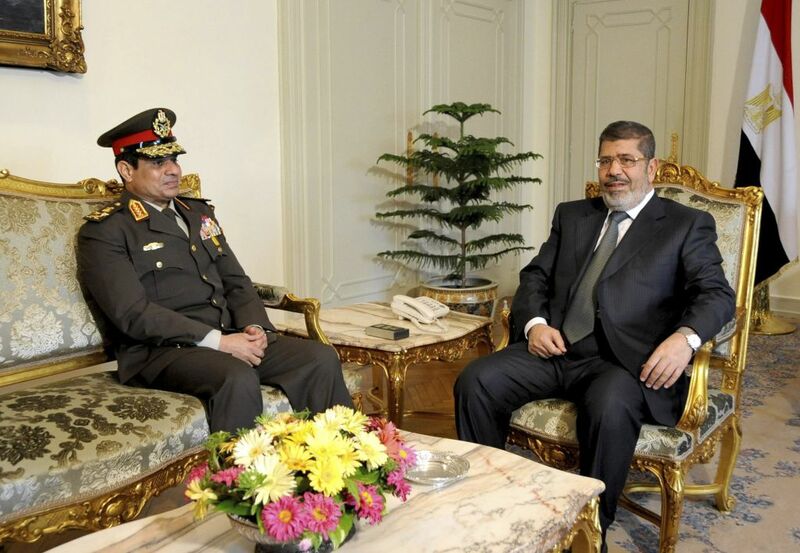 Sisi led a coalition to overthrow Morsi; and did in July 2013. Morsi was charged with terrorism and sentenced to death on 21 June 2014. Domestically, Sisi’s image of being tough on the Al Jazeera journalists is not unpopular. By all accounts, the Australian Government has thrown everything it has at this case; and a little bit more. On 28 March 2014, Australian PM Tony Abbott spoke to interim Egyptian president Adly Mansour, and stressed Greste was in Egypt to do his job, and not to harm Egypt. Sometime on the weekend of 21-22 June 2014*, Abbott and Sisi spoke. Abbott said, ‘I congratulated him on the work the new government of Egypt had done to crack down on the Muslim Brotherhood’. The call for Peter Greste’s freedom, and also for that of his colleagues, has been ‘bi-partisan’ in the Australian Parliament. In December 2014, the Senate endorsed a Greens Party motion in support of Peter Greste. By both Greste’s family’s account before his release, and Greste’s since, Australian Foreign Minister Julie Bishop has been a great support; as well as the department, and the diplomatic staff in Egypt. And there is no doubt Bishop seemed genuinely shocked and upset by the verdict in the first trial (the Egyptian Ambassador was called to her office for a ‘chat’ the next day). But by Greste’s own admission (on 29 August 2015), as ‘forceful’ and formidable as Bishop might be, Australia does not hold much sway over Egypt; for example, Australia isn’t a significant trading partner (Australia is 34th on Egypt’s list of import countries; and 75th on Egypt’s list of export destinations). However, as Greste says, ‘Australia has friends’ (looking at you U.S.A. and U.K.). *That same weekend, ex-President Morsi, and Muslim Brotherhood leader, was charged with terrorism and sentenced to death on 21 June 2014. At the first trial verdict, four ambassadors were in the court (which is quite a significant and beefed-up gallery) – they were from Australia, Britain, the Netherlands and Latvia. At the retrial verdict, it was reported that the Canadian and British ambassadors were in attendance. By all accounts, Canada could have done a fair bit more for Fahmy. It has been reported that Prime Minister Stephen Harper spoke to Sisi by phone in March 2015. It is thought that that was the first discussion between the two on the FreeAJStaff matter (If true, that is a whole year later than when Australian PM Abbott spoke to the acting-president). Two days later, Mr. el-Sissi commented in an interview that he would use his presidential powers to pardon the Al Jazeera journalists once the retrial has concluded, according to an Egyptian newspaper. He said he would not intervene before that time out of respect for the country’s judiciary. It is unclear whether Mr. el-Sissi’s comments are connected in any way to the phone call with the Prime Minister. On the eve of the first verdict in June 2014, U.S. Secretary of State John Kerry visited Egypt to meet with Sisi. He had unlocked $575 million in military aid for Egypt, frozen since Morsi’s removal. Kerry gave Sisi some new military aircraft too (10 Apache helicopters). Talking to media after the verdict, Kerry was clearly ‘annoyed’. On 26 September 2014, in an Egypt meeting, Obama pressed Sisi on human rights & specifically on freeing detained journalists. On 29 August 2015, U.S. Department of State released a statement saying it was deeply disappointed and concerned with the re-trial verdict. The U.K. has two citizens among the ‘in absentia’ Al Jazeera journalists: Dominic Kane and Sue Turton (and why its diplomats have been in the courtroom at trial/s). A day after Morsi was sentenced to death in 2015, British PM David Cameron invited Sisi for a visit to the U.K. later in the year. It is a discussion for another time (as Greste said in his press conference on 30 August 2015), but in short, in the effort to fight the ‘death cult’, the Abbott Government has proposed stripping Australian citizenship from dual-nationals involved in terrorism. Greste’s father Juris (quite possibly now Australia’s favourite retired-architect) is originally from Latvia. This, to Peter’s surprise in prison, meant Peter could get Latvian citizenship, and he did. Now I don’t know the exact thinking and reason behind that, but you would have to reckon that it is better to have two countries fighting in your diplomatic-corner than just one. But now, Peter Greste, a dual national Australian-Lativan, is a convicted terrorist. It will be interesting to see if and where Peter’s case finds itself in the discussion about the proposed change to the Australian laws. Fahmy and Baher Mohamed are already back in prison in Cairo, and Greste continues to shout as loud as he can from the other side of the world. In a press conference on 29 August 2015, Al Jazeera management said that the Egypt court has 30 days to prepare and present the official written verdict and sentence, and then Al Jazeera has 60 days to file an appeal with the Court of Cassation (the highest court in Egypt). Fahmy, with help from the Canadian Embassy and his lawyer Clooney, is said to be trying to get a deportation to Canada. Greste says he and his legal team are looking at what legal avenues remain. One possibility is that if all legal avenues are exhausted, a Presidential pardon can be requested. As long as the charges stand, it is difficult for him to do his job – he is a foreign correspondent and working in countries that have extradition treaties with Egypt could be risky. Baher Mohamed is arguably in the hardest situation – he doesn’t have an embassy or ambassador or foreign minister in his corner, as he is ‘only’ an Egyptian. This was updated with added links and detail on 31 August 2015. Please share widely, we need to better understand what is happening over there, if anything as an antidote to orientalism but surely for the critical value of media freedom.